I’ve found Facebook to a be a powerful tool. It’s a fact that Facebook has managed to compete with Google for the sheer number of visits it receives every day. Many people use Facebook and the number is still growing. More than just just a friend to friend network, it allows you to find causes, organizations, groups and businesses that have established a presence. These presences are called “Fan Pages”; basically every time you see a like button on a page, you’re sharing an a piece of content and this can be an application, web site or fan page. Fan pages are definitely a powerful promotional tool. Some have over a million people who have subscribed to them by clicking the “like” button. If the subscribers haven’t hidden the posts made to the fan page, then every time the fan page owners update their page, those subscribers see the update. 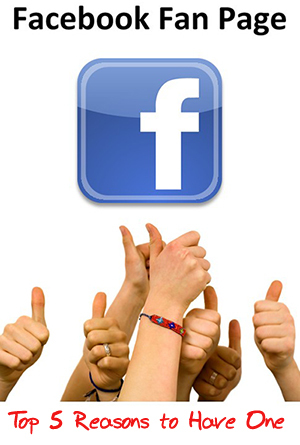 I’ll give you five great reasons to why having a Facebook fan page is important. Having a web presence is important. It’s often likened to how important having a phone book listing was 20 years ago. Only now, there’s so much more information you can publish for people to find when they seek you out. If you establish a website, you’re sure to be able to put it on your business card and be found in search engines like Google and Yahoo when people search for you. Creating a Facebook fan page puts you in a position to be found by people searching Facebook. What’s more and though seems simple is very powerful; you can be found and shared by people to one another. Being found isn’t enough to keep you in someone’s mind. Say that you have a restaurant and have 1,200 people who have “liked” your business’s fan page on Facebook, subscribing to it. Many of these will be your customers. Each time you update your fan page, what you post is sent to each of those 1,200 people’s “Facebook wall” for them to see and also can be seen by their friends visiting that person’s “wall” page. Think of how you might promote anything, whether business, person, idea or cause. Being found is the easy part. Being able to communicate with a business who was faceless and you couldn’t contact directly in a convenient manner for everyone involved is novel and powerful. Getting to know your customers and being able to answer their questions or comment on what they have to say to you builds a relationship. This relationship exceeds the norm and enables you to further build a reputation. Offering print or e-mail flyers and posting advertisements with discount coupons used to be some of the only ways to deliver coupons. With a facebook fan page, you can now deliver coupons to those 1,200 “fans” I mentioned earlier who may share them with their friends and have more exposure than you expect from those 1,200 people. Plus, even if 300 people of those 1,200 people act upon it and come in to use the coupon, you’ve managed to get 300 customers that may not have come in otherwise and you build customer loyalty by giving them a discount. Doing the math, you can easily see that you’ve done the promotion of the coupon for free. Awareness of your presence can potentially multiply. Even more than just getting people to know you. If each of those 1,200 subscribers has 500 friends that visit each person’s “wall page” regularly your coupon promotion will reach far. This won’t be 1,200 people or even just 2,400 people, but potentially 600,000 people who may be interested in using that coupon.